Let’s be real with ourselves; one of the single most frustrating kitchen-related tasks is having to clean your oven. For starters, the inside of an oven is a multi-sided surface with upwards of two or three shelves, depending on your unit; that’s a lot of ground to cover. Secondly, the kind of grit and grime that builds up inside an oven is extremely difficult to remove. It’s a daunting, time consuming task that most people don’t set aside to undertake. Thankfully, manually having to clean ovens is something that’s gradually on the way out, as self cleaning ovens become a more viable option for homeowners. What you may not know is that there are actually different kinds of self cleaning oven. We’ve covered one kind before known as pyrolytic, but as a brief reminder; pyrolytic ovens make use of something called pyrolysis, a process where organic matter begins to decompose at extremely high temperatures, to literally burn off the grit and grime that builds up inside them. Once the process is done, all that remains is a pile of ash that can be dealt with using a dustpan and brush. One of the other popular forms of self-cleaning oven are Catalytic Ovens. Rather then relying on an active method, Catalytic ovens rely on a passive, natural process to break down dirt. In layman terms, the inside of a Catalytic oven is coated in a high-metal, porous enamel that oxidise the soil building during normal operation. Some of the materials used in the coating process include copper, vanadium, bismuth, molybdenum, iron, nickel, or tin. Ovens that uses Steam Cleaning technology are also typically Catalytic in nature. In the interest of being fair and impartial, it’s worth noting the pros and cons of self cleaning ovens as a whole. On the upside, in addition to reducing the stress of manual cleaning, self cleaning ovens are also more heavily insulated then regular ovens. This not only greatly reduces the risk of fire, but also reduces the amount of energy needed for normal cooking. 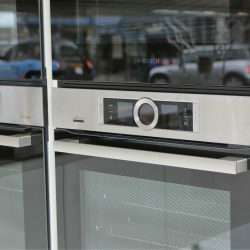 If you’re interested in purchasing a Pyrolytic oven, however, we must point out that the high temperatures needed to burn off the grime buildup can more produce smoke and odours then normal ovens. This could potentially set off fire alarms in extraneous circumstances, and are highly toxic to pet birds. Experts claim that regular use of the cleaning function will reduce smoke or odour buildup, however. Here’s a bit of interesting trivia to close us out; though self cleaning ovens are closely associated with the modern kitchen, they’re not as recent an invention as you may think. In fact, in 1963, General Electric introduced their P7 model oven, one of the very first to use Pyrolysis as a means of self cleaning. Another form of self cleaning oven that has fallen out of favour in recent times is the Continuous Cleaning Oven. Similarly to Catalytic ovens, the inside is coated in a rough, porous enamel finish, which would cause the soil buildup to spread over a wider area. The thinking is that a wider, thinner layer of grease would burn off more easily during the cleaning process, but in practise it never really worked as well as intended. This is the main contributor to their decline in popularity.